I love dahlias. They’re definitely one of my favourite Summer garden flowers. 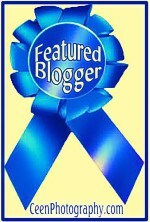 I’m often admiring Cee’s photos of beautiful dahlia blooms over at Cee’s Photography. In my small back yard, I don’t have enough space to grow the tall varieties of dahlia, but this year I decided to sow a few pots of dwarf dahlias. I tried this a few years ago, but that Summer was a bit of a washout and the dahlia flowers only grew to the size of large coin. This year, as part of making more use of the vertical space in my yard, I have my dahlia pots carefully balanced on the new plant shelf, so the plants can catch more of any Summer sunshine that comes their way. I’ve been watching with hopeful anticipation as my dahlia plants have grown on and developed their first flower buds, despite our largely cool and windy weather so far this Summer. 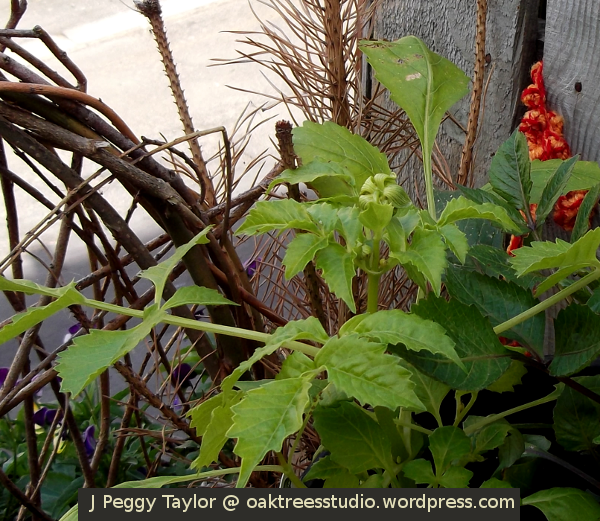 Then, on Thursday this week I was delighted to see the first dahlia bud had burst open to reveal its sunny radiance. Gardening in a small space means there’s never enough room for everything you want. I’ve begun to make more use of the vertical space, especially along the sunny fence as I was showing you in this previous post. During Spring and Summer, my indoor window ledges are also pressed into service as ‘gardening’ areas for herbs and salad leaves. I try to grow some food crops as well as flowers. 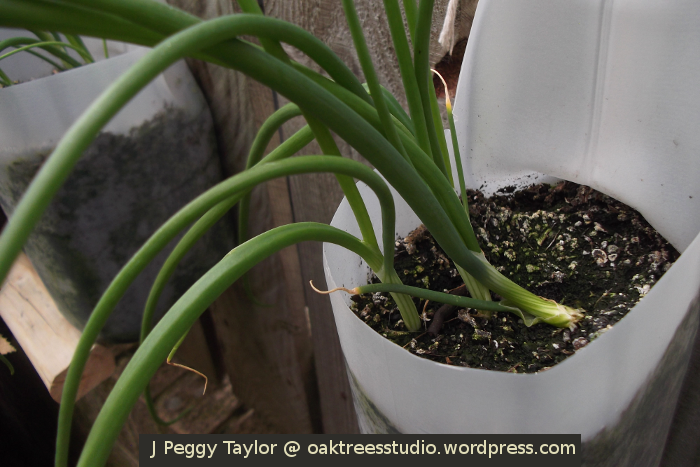 This year I’m experimenting with growing Spring Onions both outdoors and indoors. The variety is DT Brown’s classic, White Lisbon. 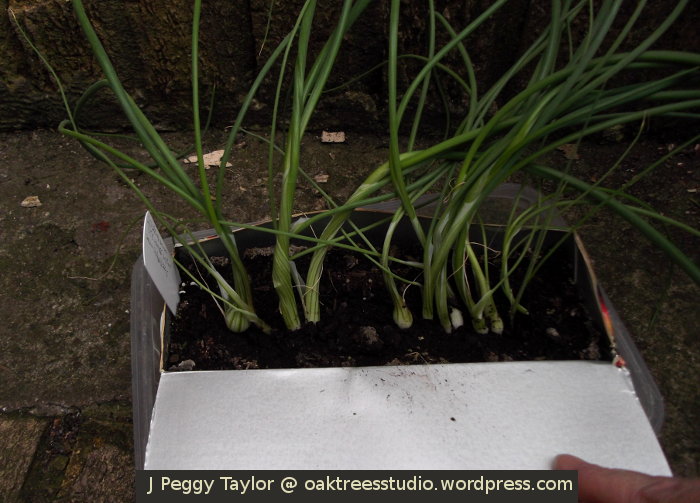 The indoor Spring Onions are in an upcycled apple juice carton. I wasn’t sure if this would be deep enough for them to fully grow. The idea initially was to pot them on into a deeper container but somehow time got eaten up by other things and the seedlings grew too large to be able to transplant them without damaging the roots. Hence, the Spring Onions are still growing in their apple juice carton on my kitchen window ledge, but they don’t seem to have suffered too much it seems. They’ve grown on well from sowing in early April and some are almost ready for harvesting now. 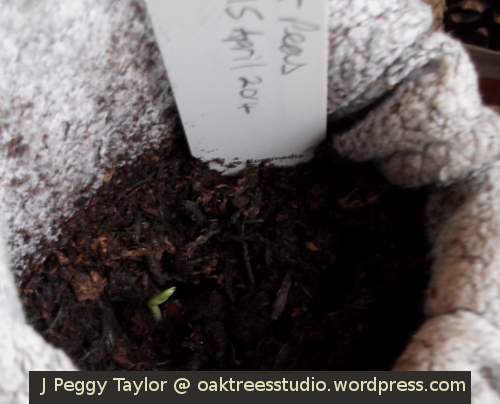 As I was preparing this post, I noticed I’d sown 20 seeds and this has resulted in a dozen plants. 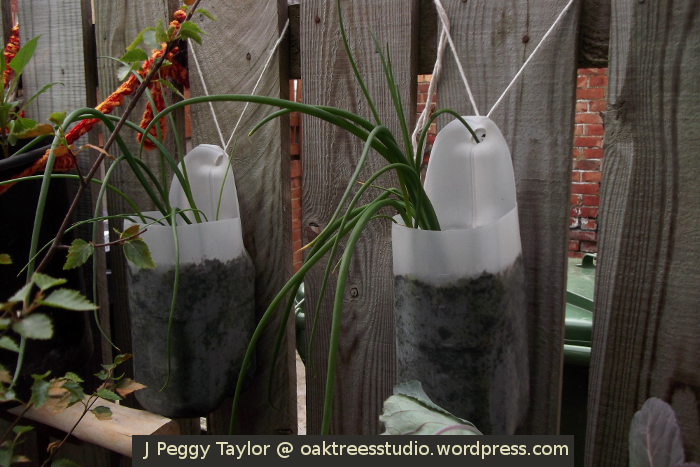 My first two pots of outdoor Spring Onions were first sown into a small ‘propagator’ (upcycled food packaging) and kept on the kitchen window ledge. 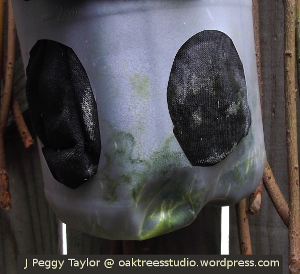 When the seedlings showed, I transplanted them into upcycled milk cartons and then I moved them outdoors. 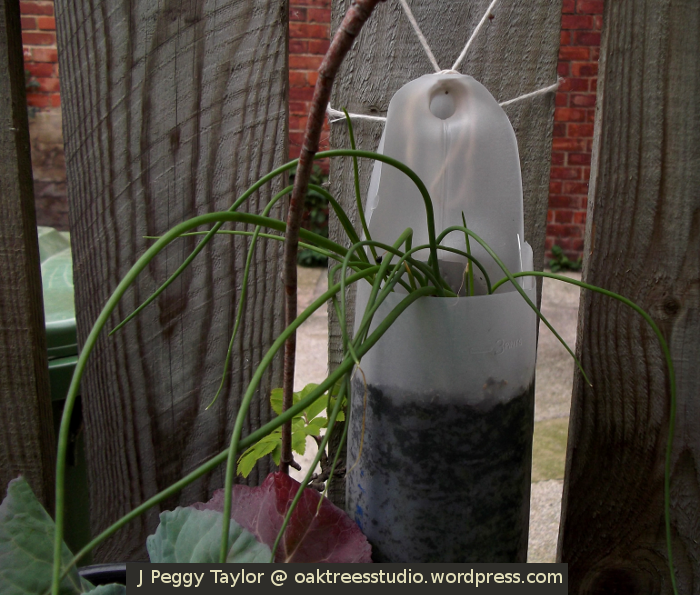 For the final sowing of Spring Onions at the end of April, I sowed another small batch of seeds directly into their upcycled milk carton pot and hung them outside straight away. 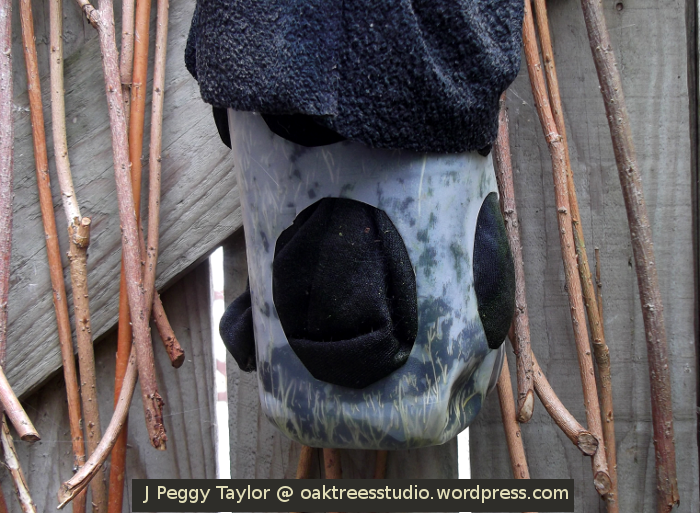 The milk carton plant pots are just hung on the sunny fence with string. 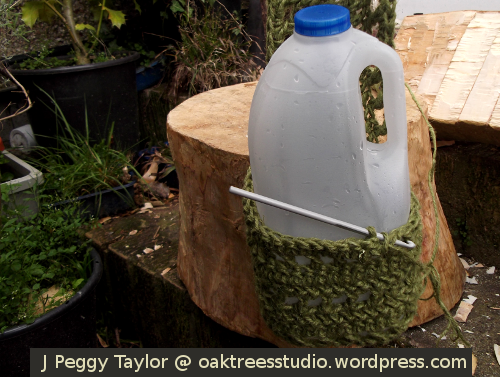 Keeping the jug handle on the milk carton plant pots is useful for tying them onto other supports, I’ve found. 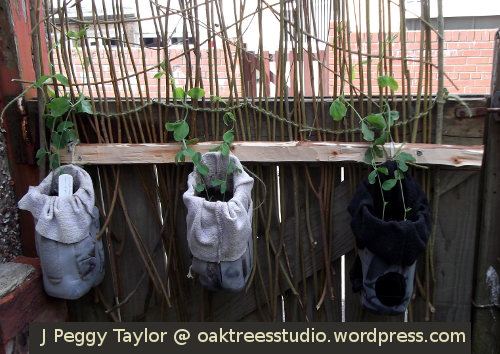 I’ve done this with the air-pruning plant pots I made from milk cartons to hang on my willow garden screens too. All of the outdoor Spring Onions have grown on well, despite regular buffeting by the seemingly incessant wind this Spring and Summer. The White Lisbon Spring Onions have been easy enough to grow. Regular watering has been the only after-care needed. I’ve been pleased to note that another benefit to my vertical gardening experiments has been … so far! 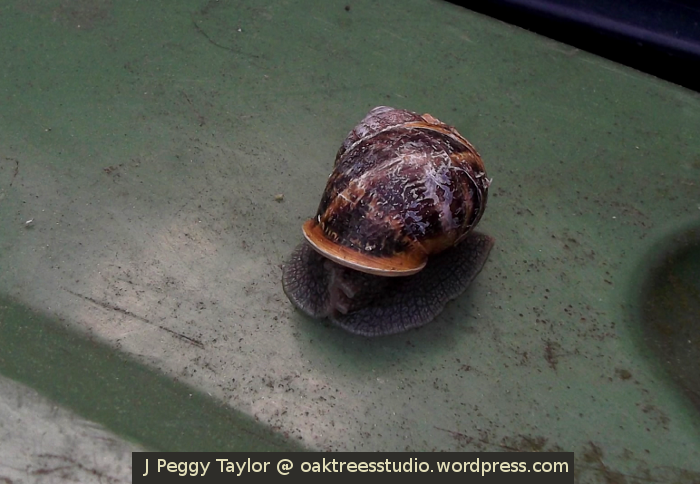 😉 … the plants seem to have stayed safe from the munching molluscs that share my yard – or perhaps they’ve just been too busy grazing on my Sweet Peas! This Spring I’ve been building on my back yard gardening ideas from last year but to make sure there’s always colour in my yard – regardless of whether the plants thrive or fail – I’ve also gone in for a bit of yard yarn bombing this growing season too. I’ve tidied up the wild crochet jute and willow garden screens that I made for my Sweet Peas last year and turned them into slightly neater, but still very rustic, willow arches. 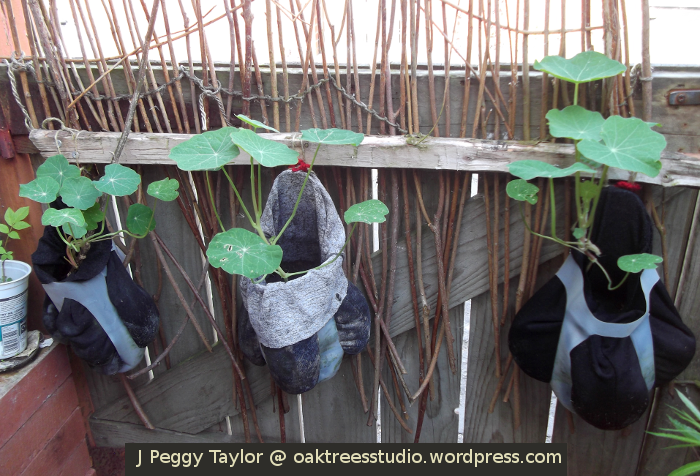 This Summer the willow garden screens are going to support the nasturtiums I have sown in their fabric growbags in some of my upcycled air-pruning plant pots. 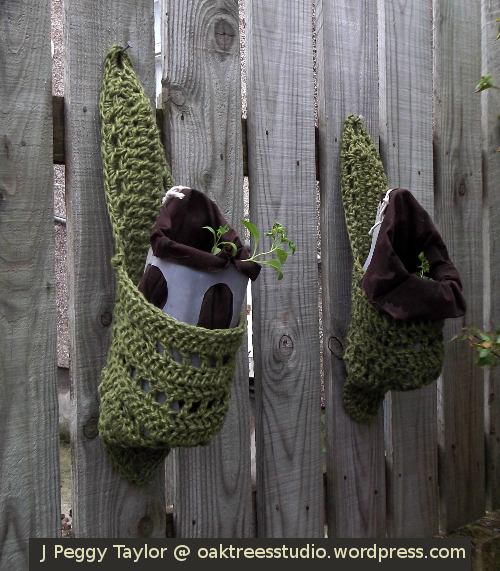 The fabric growbags and air-pruning plant pots have been made the same way as last year. 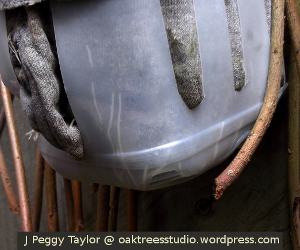 If you’re interested in seeing how I made these upcycled air-pruning plant pots you can see the process here and here. Keeping with the rustic woven willow theme, I’ve added a large basket planter on the outside wall of my yard, overlooking the street. The basket frame is made from green hazel rods, carefully bent around into an oval shape and fastened with some brightly coloured crochet chains. I added some thinner willow rods that I had to hand to make the top half of the basket. 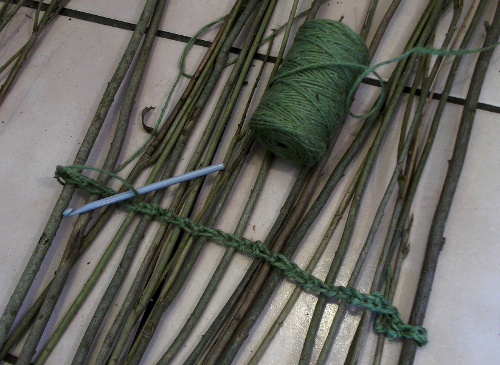 I plan to finish off the weaving with some green willow rods at some later time. I then lined the basket planter with a sliced-open empty plastic compost sack and I filled up the basket with a soil and potting compost mix. I used some soil to create weight in the base of the basket and also because the soil will help to retain water better than just potting compost alone. 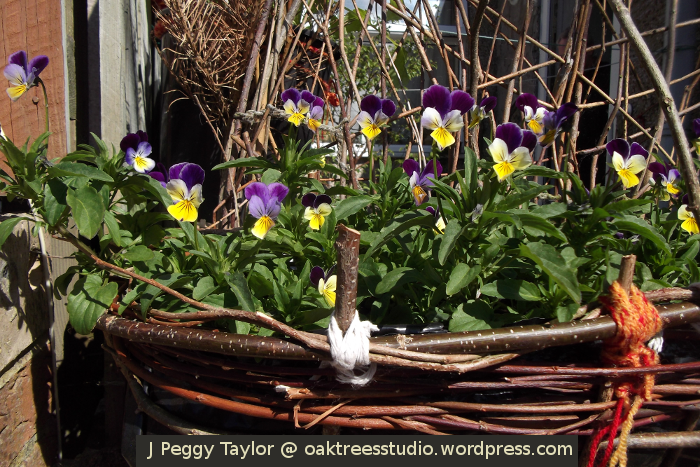 My old-fashioned ‘Johnny-jump-up’ violas had grown on well from sowing at the end of March and were just beginning to flower when I planted them out into the new hazel and willow basket planter on my back yard wall. I do think the violas look lovely with their little purple faces nodding in the breeze. With so little growing space, I’ve gone further overboard with vertical gardening this year in my back yard gardening, with a new plant shelf to take more advantage of the fence area that sees plenty of light and sunshine. This new plant shelf is now home to pots of dwarf dahlias, which are growing on well since I potted up my seedlings, and some irises that don’t seem to be growing on too well at all just yet. To secure the pots onto the shelf, I devised a strong crochet plant pot sling and crafted these in different colours to give this new growing area an instant colour splash. As I was watering my pots yesterday, I was excited to see the first dahlia flower bud appearing on one of my plants … I will be watching and waiting – what colour will it be! Growing plants in air-pruning plant pots was a new experience for me this year so I have been watching and learning from my Sweet Peas as they have gradually progressed. 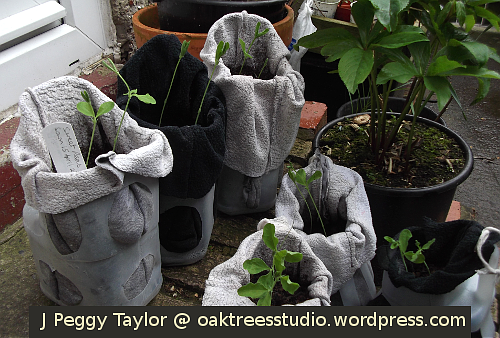 It seems a long time since mid-April when I sowed the Sweet Pea seeds in their cosy grow bags inside my upcycled milk carton air-pruning plant pots. 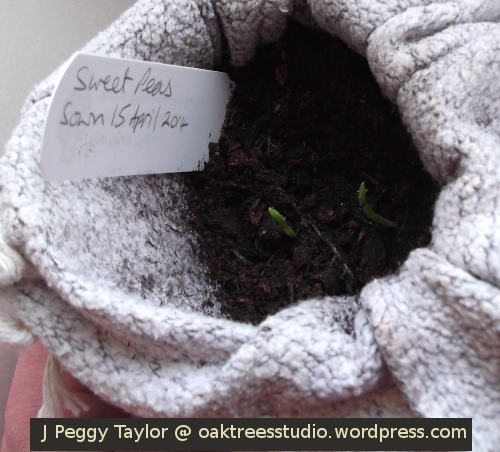 The seeds quickly germinated and the Sweet Pea plants were soon on their way. 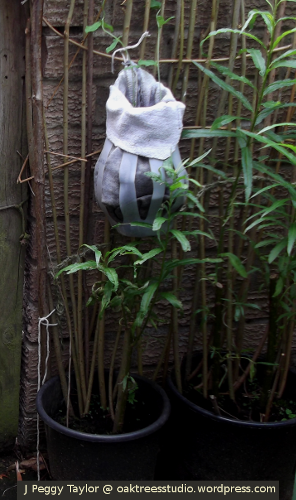 When I put them outside in the middle of May, the plants only just reached up far enough out of their pots for me to encourage the shoots to set off on their journey up the jute and willow garden screen that I had specially constructed for this purpose. By the end of July the plants were grown to their full height (1.8 metres/6 feet) and the first flowers appeared … pink, followed by white and then a deep maroon. 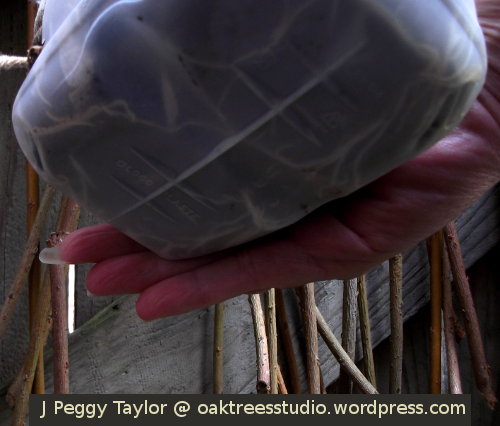 Whilst generally I am very pleased with my air-pruning experience during this Spring and Summer, I have encountered a couple of problems with my gardening experiment that I thought I’d talk a bit about in this post. I set three pots of plants to grow from behind my small yard wall (approx. 90cm/3 feet high) and three pots of plants to grow up over my yard gate, which is around the same height. Although these two areas are only inches apart, they have very different micro-climates. The small area behind the brick wall is fairly dark and damp because it is immediately adjacent to our refuse and recycling bins. 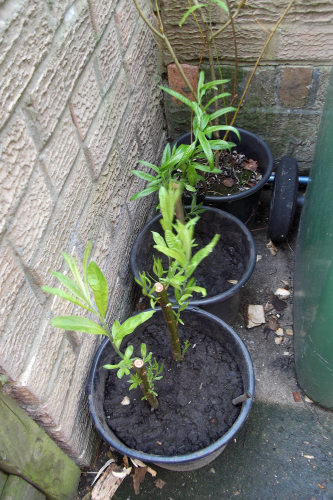 I had also previously planted my new Willow cuttings in their pots in this corner of the yard and, as they had grown on a little, they affected the light level too. The combination of these elements means this part of the yard tends to stay cooler with no direct sun. The wooden planked gate forms the boundary to the other half of the yard. With the open yard area immediately inside the gate, this half of the yard has more air movement, plus the warmth of the sun soon warms up the wooden gate. In the cooler, damper conditions behind the wall, it wasn’t long before the snails showed up! When I say ‘showed up’, it was mainly a case of ‘left a trail’ … not only of glistening slime, but also of half-chewed leaves – though only on one particular Sweet Pea plant. Why only one plant, I can’t be certain – but I was pleased to see at least it wasn’t all three! 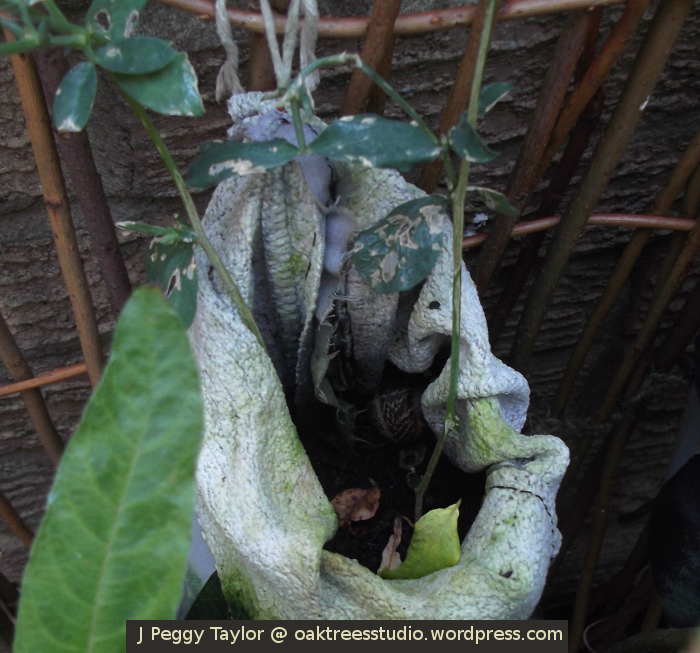 Spot the snail snuggled into the Sweet Pea grow bag! One day I managed to catch up with my plant-munching visitor as it snuggled down into the evidently-too-cosy grow bag! Have you ever found yourself addressing a mollusc?! I must say, I took pity on the poor starving creature who was, of course, merely seeking an evening meal and a bed for the night! I did however remove it from the Sweet Pea pot and found it a new home elsewhere! 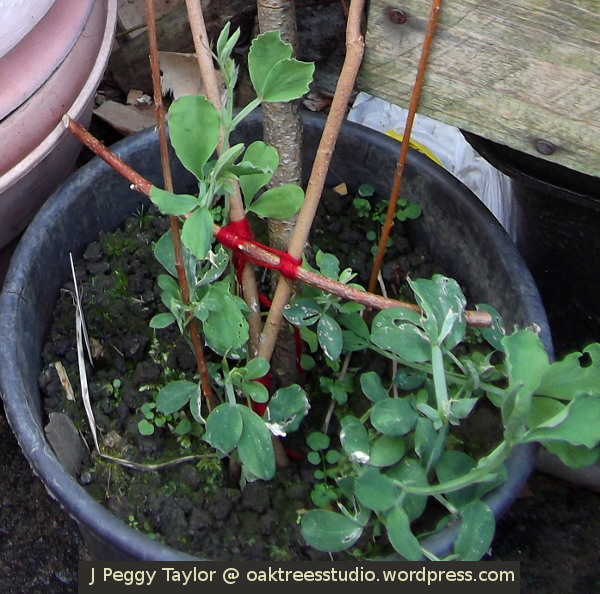 There was one other aspect of my Sweet Pea air-pruning plant pot experiment that I have could have been happier with and that relates to the size of the pots I chose to use. If you have grown Sweet Peas before, you will know they normally prefer to grow in quite deep soil. However, I had previously grown them successfully in a pot that was not much deeper than the air-pruning plant pots I was using this year, so that was why I had decided it was worth the experiment. The problem I encountered was this: as the plants grew taller, the lower leaves quickly yellowed, despite regular watering and feeding. I took a close look at the root systems as far as I could observe them from the outside of the pots. The roots had grown well and exactly as expected in the air-pruning plant pots. There were only the tips of roots showing inside the closed-in areas of the pots. 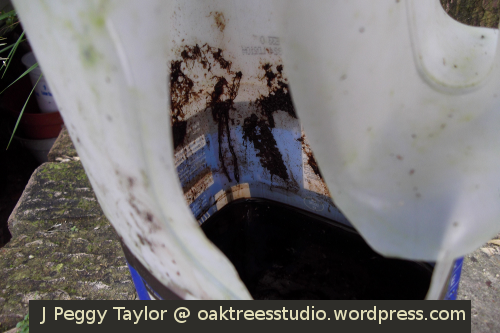 Where the fabric grow-bag was open to the air, the roots had not penetrated the grow-bag. I will be taking an even closer look at how the root systems have developed when the plants are finished flowering and I take them down. 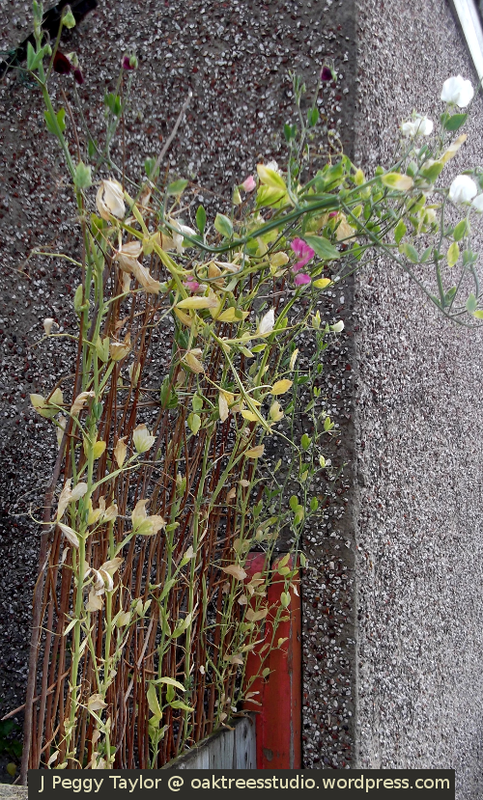 I was very pleased that the Sweet Pea plants grew to their full height, though on hindsight, given the plant pot size I had used, I would probably have been better managing the growth differently. I nipped out the main growing tips when the plants reached the top of the screen, but if I had done this a little earlier and kept the plants a little shorter, I think perhaps the issue with the dying foliage may not have been so bad. The size of the pots has definitely been an issue I’d rethink for another time. I need either larger pots for Sweet Peas or perhaps I need to choose a smaller growing plant. 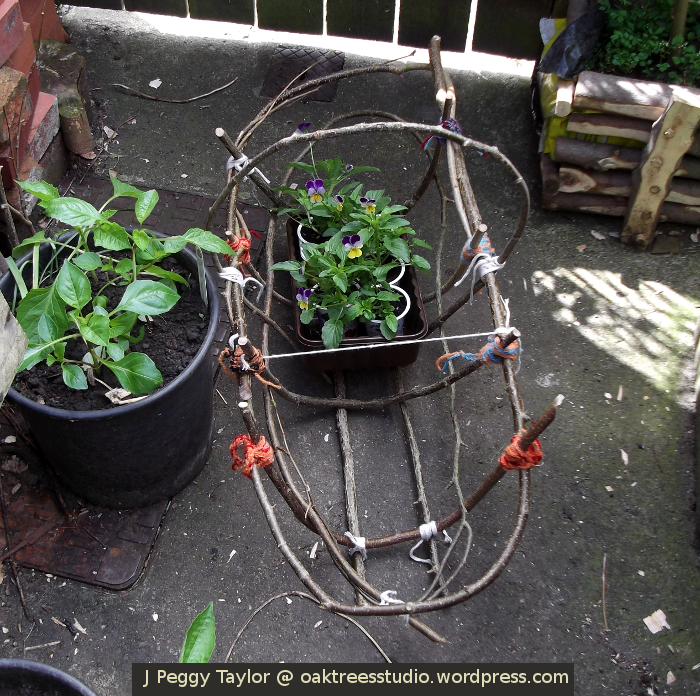 Another idea I had intended for some of the Sweet Pea plants was to plant them into a wooden plant trough. But, as so often happens, time simply ran out for that idea this year. However, I may contemplate creating some troughs in either wood or woven willow for next year so I shall add it to my Winter projects list! 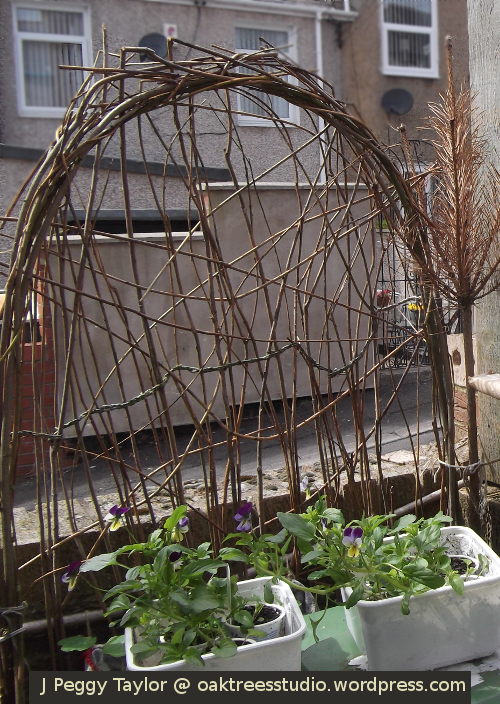 The crochet jute and willow garden screen – completed! The crochet jute and willow garden screen that I have been creating as a support for my Sweet Pea plants is now complete. This second part of the willow screen I have made just like the first one, using two rows of crochet green jute yarn to bind the willow rods together. I needed to make this part of the willow screen a bit shorter than the first one because this one is to go on the back of my yard gate. I wasn’t too sure how this part of the garden screen was going to work out when I came to fix the screen in situ. This part of the experiment was going to be interesting … discovering whether my plan would go exactly according to plan! My wood-crafting son helped me out with the hand-hewn batten I wanted, to hold the willow screen for the gate in place. The batten is made from a short length of sycamore branch that we happened to have lying around. After sawing it to length, we removed the bark and my son deftly axed it into shape so that it could be easily screwed onto the back of the gate. I love the smooth, pale grain of sycamore. Next, I pre-drilled holes in the appropriate places after I’d checked precisely where the batten was going to fit onto the gate and I partly inserted the screws ready to attach it. To fix this second piece of my willow garden screen in place, I first tacked the lower row of jute crochet to the top of the gate using small fencing staples. I then loosely attached the batten at each end whilst I reorganised some of the willow rods that I found had slipped out of place. 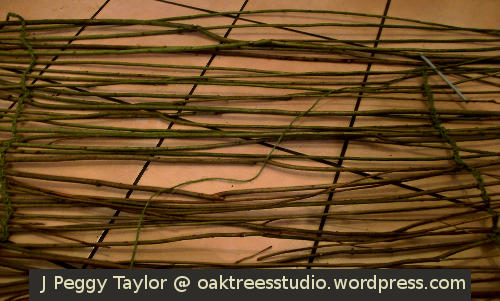 When I was happy with the position of the basic frame, I then began weaving some thinner willow rods across the garden screen. I worked in a random fashion, just as I had done with the first part of the screen. I was aiming for the garden screen to still allow a lot of light through it so that the light would continue to reach the numerous other trees and plants in my yard. Even though the willow weavers are very thin, they do provide a reasonably sturdy structure on which my Sweet Pea plants can grow. I made sure there was a slightly stouter rod at each end of the willow screen to provide stability. 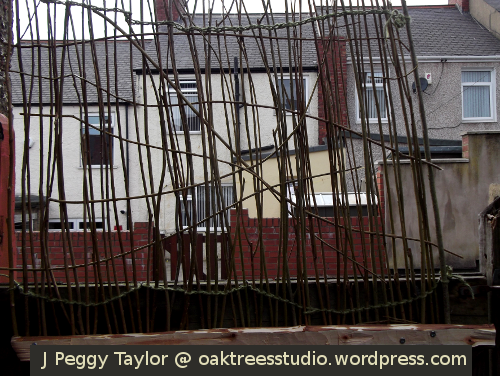 I had wondered about the overall stability of the willow screen in windy conditions, as I mentioned in a previous post on this project, but the first part of my garden screen has been in place for a couple of weeks now and has survived some moderate winds … so far so good! Now it was time to attach the air-pruning plant pots with their cargoes of Sweet Pea plants onto the willow garden screen. 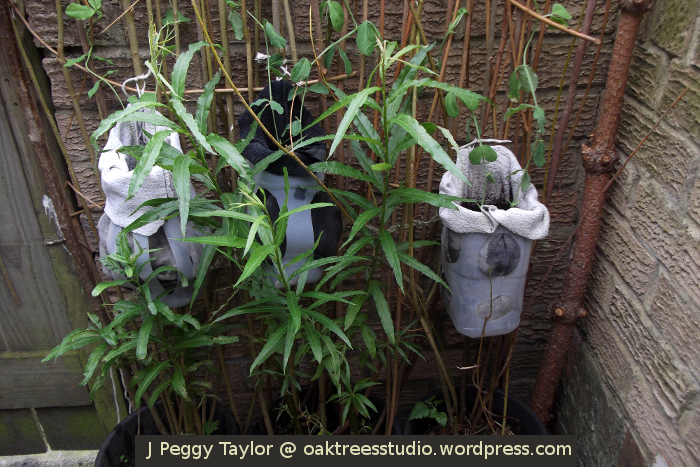 I had experimented with one plant pot a couple of days ago on the first part of the willow screen and my design plan seems to be holding up well, so I set to work attaching the other five plant pots. 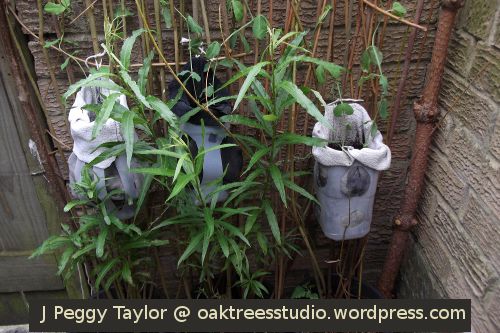 As I had anticipated, the handles of my upcycled milk carton air-pruning plant pots came in very useful at this stage. I tied the plant pots firmly in place, making sure they couldn’t slip out of position as this could potentially damage the growing plants. For the three plant pots near my wall, I used the string loop I’d added to each plant pot for this purpose. 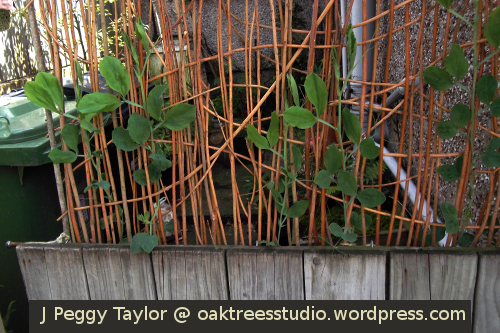 I’d initially thought I might just stand the Sweet Pea plant pots on top of the plant buckets into which I’d inserted the willow rods of the garden screen, along behind my yard wall. But some tell-tale slug trails nearby suggested it may be a good idea to tie the pots a little higher – hopefully out of temptation’s way! The recent experience of slugs and Soapwort is still fresh in my mind! To secure the Sweet Pea plant pots to the back of my gate, I decided to use my new firmly fixed sycamore batten. 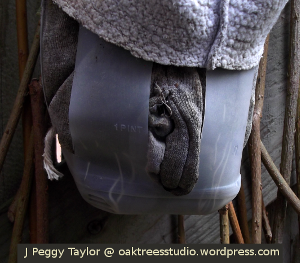 Again I made use of the handles of the recycled milk carton plant pots when attaching the string. 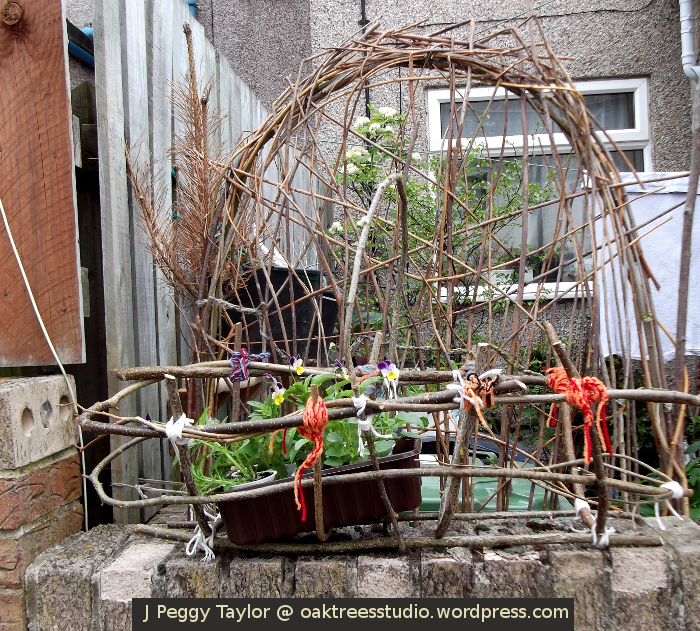 When I had all of the Sweet Pea plant pots in place, my final task was to carefully arrange the growing plants, weaving the stems in and out of the willow screen where I am hoping they will continue to grow and flourish. 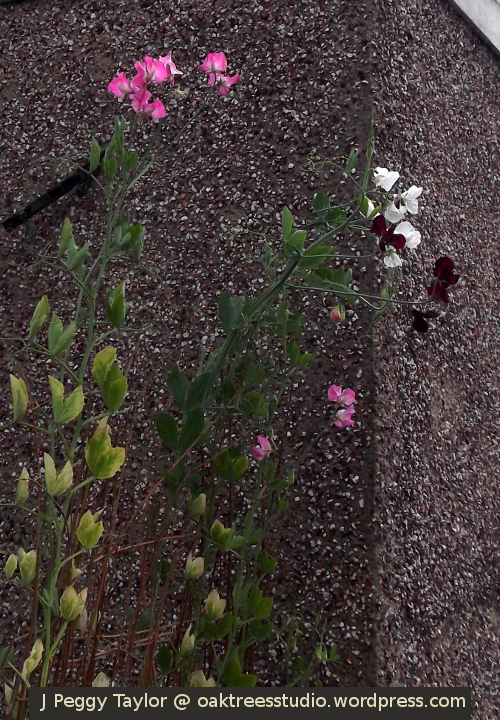 Perhaps before too much longer I will be able to post about my first Sweet Pea flowers – I do hope so! I was so inspired by the air-pruning video I shared with you a few days ago that I immediately decided to try out this seemingly magic method of improving plant growth. I already had imminent plans for sowing some Sweet Pea seeds as I am planning on training several Sweet Pea plants to grow up and through the crochet jute and willow garden screen that I have also been working on recently. 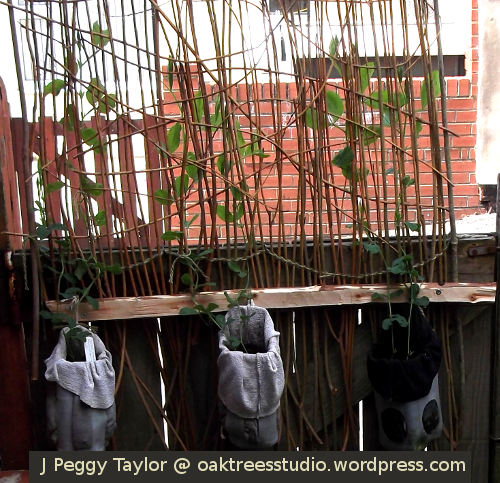 The willow garden screen project is my experimental version of location-specific vertical gardening. As my back yard is only very small I needed to develop some air-pruning pots that would be more size-appropriate than the 5 gallon buckets they used in the video. But I also wanted some containers that would reasonably accommodate the Sweet Pea plants. I have grown Sweet Peas in my yard in the past using moderately-sized containers and with a bit of care they successfully reached their full six-foot height. A further consideration was that I need to be able to attach some of the plant pots to the back of my yard gate, so lightweight containers with ‘attach-ability’ were additional factors to bear in mind. 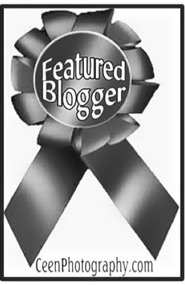 And, as I frequently do, my preference was to use upcycled materials for this project too. 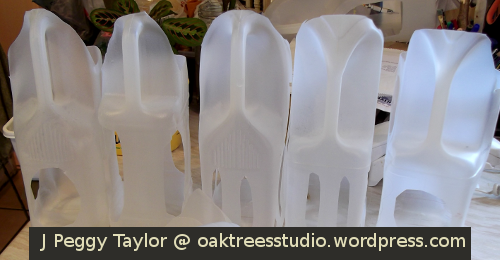 The solution to my air-pruning plant container conundrum is … four-pint milk cartons! These milk cartons satisfy all of my requirements – lightweight, with built-in handles for ‘attach-ability’, moderately-sized and easily re-designed for their new purpose … and upcycled. Fortunately, I had a number of these milk cartons readily available as I had saved them ‘just-in-case-I-need-some’ – I’ve made milk cartons into standard-type plant pots on previous occasions. But this time my design plan was rather different. I began by making a large planting hole at the top of each carton by cutting around the original milk carton’s opening. You can see I have cut high above the carton handle to leave the whole handle intact. Around the sides and front of the carton I dipped down a little lower with the scissors to make a reasonably-sized opening to give accessibility. Next I pondered on the best way to ventilate the sides of the cartons to provide the air-pruning effect. The air-pruning video showed circles cut out of the sides of the 5 gallon drums. I emulated this on the first carton, cutting out relatively large holes all around it. However, I then wondered if different shaped holes would be more or less effective at air-pruning. 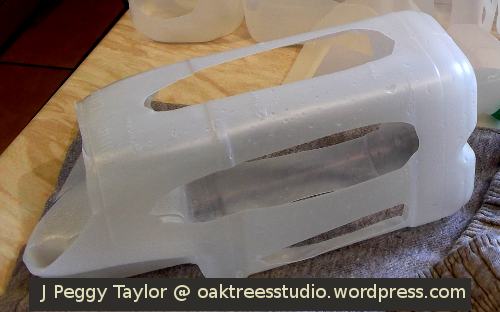 To test out my curiosity, I have decided to make different shaped holes in some of the cartons. Two cartons have circles, two have wide vertically-oriented ovals and the remaining two have a series of narrower vertical vents. It will be interesting to see if the different-shaped vents in the containers make any difference to the plant growth. 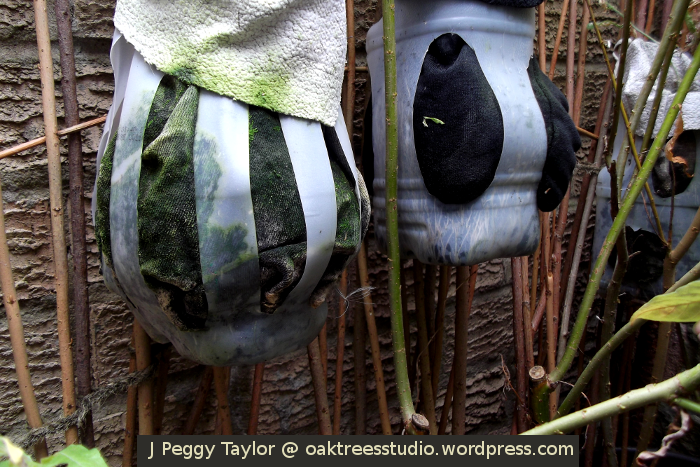 Watch out soon for Part 2 of my upcycled air-pruning plant pots project in which I will show you how I made the fabric grow-bags to fit inside the pots. To grow even more things in my very small back yard I am now looking at vertical gardening to expand my growing space. I have seen some interesting versions of planting in vertical space but I’ve decided to go for my own personal twist on this concept. One of the first problems I needed to solve is that I want to be able to take advantage of some vertical space that at present is completely open, above a small brick wall and a low-level gate. I’m not looking to create a permanent feature as I want to see how using this vertical space will impact on light levels for other plants I have growing in the yard. I am keen to keep the screen structure quite natural-looking and not overly dense to allow light through as well as incorporating natural materials. 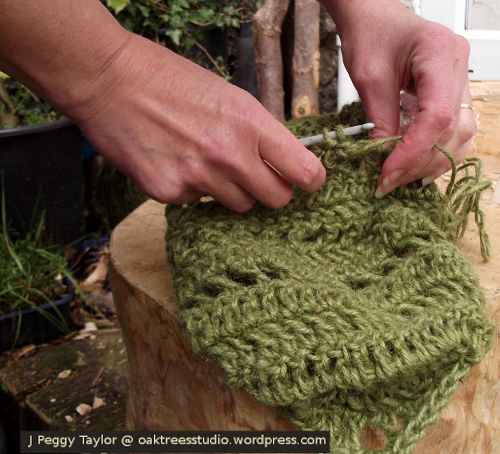 At present I am designing two jute and willow screens which combine crochet and some simple willow weaving. … and what will I grow here? I’d pondered on beans or peas but, as this is a roadside and the plants will mainly be growing on the outside of my yard, I’m not keen on that idea. I’ve decided to try for a good showing of sweet peas. I love these flowers, especially the old fashioned scented ones.